More information about membership in Prestige Club can be found on our Membership page. AMBIANCE, Franklin Park is located 3 miles south of O'Hare airport and one block north of Grand Avenue on Mannheim Rd. AURA, Midlothian is located 7 miles south of Midway airport, 3 miles south of I-294 and 2 miles north of 159th Street on Cicero Avenue. All rooms and suites at AMBIANCE, Franklin Park and AURA, Midlothian feature king-size beds, flat panel televisions with 4 adult video channels, iPod docking stations and Tilt position cushions. 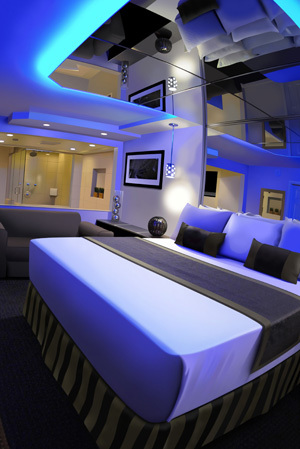 Select rooms and suites feature hot tubs, spa tubs, steam showers, vibe lighting systems, Tantra chairs and much, much more. Reservations are not required but are strongly recommended. Reservation requests can be made on-line or by calling AMBIANCE, Franklin Park or AURA, Midlothian directly. Rooms and suites are held for one hour past your estimated arrival time. In the event that you will be arriving later than one hour past your arrival time, we ask that you contact the property to update your arrival time.